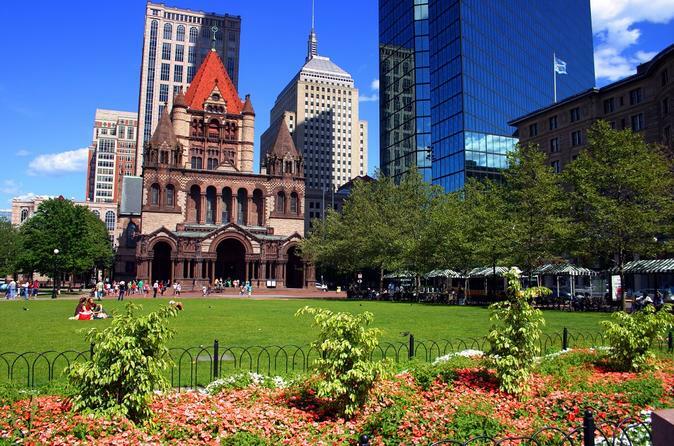 Enjoy the vibrant atmosphere of Boston on this guided, 2-hour walking tour. Travel through Downtown Boston on the popular Freedom Trail, featuring many of the locations of historical significance to the United States including Boston Common and the State House. We will see where the Boston aristocracy lives on Beacon Hill on our way to the Public Garden and Back Bay. See the Victorian brownstone homes and Copley Square in the Back Bay neighborhood. You'll see Cheers, Newbury Street and Commonwealth Avenue on our way to the Boston Marathon Finish Line. At 10am, meet and greet the tour guide outside of 28 State Street, located across from the Old State House. Follow the guide to begin this 2-hour walking tour of Boston. Start the tour on the Freedom Trail, visiting Faneuil Hall, the Old and New State Houses, The Old Granary Cemetery and the Boston Massacre Site. See the Old City Hall, along with the Old Corner Bookstore and King's Chapel. Stroll through downtown en route to Boston Common and climb to the start of Beacon Hill, where the Boston aristocracy lives. We pass by the Frog Pond and enter the Boston Public Garden. Admire the stunning swan boats as they sail under the world's smallest suspension bridge and see where all the exterior shots for "Cheers" were filmed as we stroll through Back Bay. Continue on to the John Hancock Tower, the Boston Public Library, and Trinity Church. Then cross the finish line at the Boston Marathon site and enjoy the beauty and charm of Copley Square, where the tour concludes.